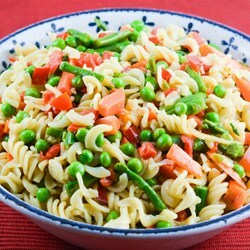 Yummy vegetable pasta salad featuring fresh vegetables and a light dressing. This salad is great served with bar-b-q chicken or burgers and garlic toast. If I’m serving this salad to seniors, I usually par-boil the vegetables in the microwave for 3-4 minutes, just until tender. Combine the mayonnaise, vinegar and sugar together, whisk until smooth. Pour over salad and mix well. Season to taste with salt and pepper and serve.